Welcome to Boyd on Dayton. Located just behind ICBC on Springfield, we are #1 in direct repair. Our Boyd Kelowna Location is open from 8 am to 5 pm Monday through Friday. 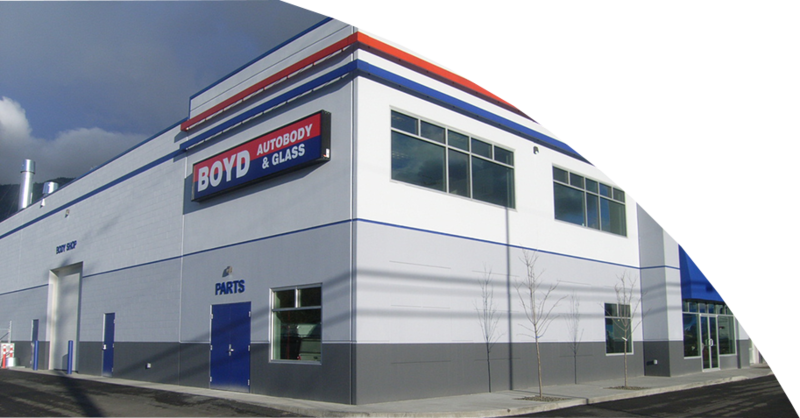 At Boyd Autobody & Glass, we have been Voted #1 Repair Facility in the Okanagan by you, over 10 years in a row. We earned this title not just by the quality of workmanship but by the individuals who work in this facility. Each of our employee’s not only believe that what they do on a day to day basis is just a job, it’s their passion. We at Boyd Autobody & Glass support our local community through a program called “Boyd’s Community Rewards”. With this program we take a portion of your repair bill and put it back into the community donating to more than 15 local charities. We invite you to visit us on Dayton for any of your repair needs. Proud supporters of the Kelowna Rockets!! Boyd Rutland is beside HWY 97 on MCCurdy place, right beside the Harley Davidson building. Our facility has about ten production staff, working in Prep, paint and detail. Our new location is both Aluminum Certified and Honda Certified Voted #1 Collision Repair Facility in the Okanagan over 10 years in a row- not by accident! The Staff and Management welcome you to visit us for any of your vehicle repair needs. Our Boyd Rutland Location is open from 8 am to 5 pm Monday through Friday. We may not be the biggest but we strive to be the best! Boyd Autobody- West Kelowna is located at 1838 Byland Rd.. Our hours are 8am to 5pm Monday through Friday. We have been proudly serving West Kelowna as a full service repair facility since 2001, and are excited about our building with state-of-the-art technology. Boyd Autobody & Glass has received the “Best of the Okanagan” award over 10 years in a row and look forward to serving you for many more. Operations Manager, Todd Harmeling, and his staff will continue to offer the superb quality repairs and excellent customer service found at our previous facility. All of us at the West Kelowna shop are proud supporters of the West Kelowna Warriors and dually proud to be a part of the West Kelowna Community. We invite you to visit us at our new location for all your glass and auto repair needs. When ” It Happens”….Bring It To Boyd! Welcome to Boyd Autobody and Glass in Penticton. Located on the corner of Carmi Ave. and Dartmouth Rd., we are #1 in Direct Repair. Our Boyd Penticton Location is open from 8 am to 5 pm Monday through Friday. At Boyd, we have been voted the #1 Collision Repair facility in the Okanagan by you over 10 years in a row- not by accident!. We earned this title not just by the quality of workmanship but by the individuals who work in this facility. Each of our employee’s not only believe that what they do on a day to day basis is just a job, it’s their passion. We at Boyd support our local community through a program called “Boyd’s Community Rewards”. With this program we take a portion of your repair bill and put it back into the community donating to more than 15 local charities. We invite you to visit us on on the corner of Carmi Ave. and Dartmouth Rd for any of your repair needs. You can also phone us at 250-492-2323 or fax our location at 250-492-0453.